Godalming Theatre Group’s Production of Oliver! 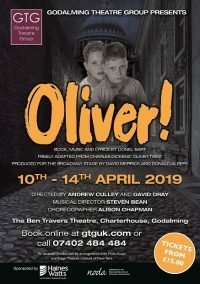 Everyone knows the story of Oliver the little orphan boy who asked for more and we are delighted that Godalming Theatre Group is bringing the musical version of Charles Dickens tale Oliver! to the Ben Travers Theatre, Charterhouse from 10 – 14th April 2019. Lionel Bart’s classic musical Oliver!, based on Charles Dickens’ novel Oliver Twist, has thrilled audiences old and young since it premiered in the West End in 1960, almost 50 years ago, taking 23 curtains calls on its opening night. Winner of 4 Tony Awards, including Best Original Score, Oliver! features a wealth of iconic songs including Food Glorious Food, Reviewing the Situation and As Long As He Needs Me.